Southern Asian Chennai marks the last in a series of launches which further included Regional Centers dedicated to markets in Africa, South East Asia and Latin America. The new operations will oversee sales and service in the six neighbouring markets of Nepal, Bhutan, Bangladesh, Myanmar, Sri Lanka, and Maldives. "Within just seven months we have succeeded in realigning our sales and service organisation in key regions of growth – close to our customers and with a clear focus on commercial vehicles. In Southern Asia we are now launching the last of a total of six new regional centers. This will also enable us to offer tailored products and services from a single source to our customers in markets such as Sri Lanka, Myanmar or Nepal," said Dr. Wolfgang Bernhard, Member of the Board of Management of Daimler AG, responsible for Daimler Trucks & Buses. 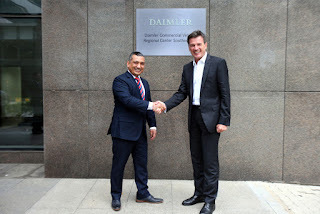 Marc Llistosella, President and CEO of MFTBC and Head of Daimler Trucks Asia, added, "The Regional Centers are an excellent example of how Daimler Trucks Asia directly benefits from the global reach of our parent Daimler. We expect these Regional Centers across the globe to provide us with substantial further momentum for exports both from Japan and India." "Demand across our brands and product lines has already been favorable, and with our new setup we see great potential to capture additional sales for Daimler," said Amit Bisht, Head of the Regional Center Southern Asia.